Lip sticks, glosses, balms...how many of each do you have right now? Being a girl, I know that a lot of us are suckers in giving color to our lips. Why not right? Only a few are given with real pink lips but it lip colors are here to save the rest of the flock like us. Since high school I was only able to try lipstick once or twice. Even when I took a hold of my own money I really did not bother to buy even simple Careline lippies. Its not that I'm not kikay(girly) but I find it quite troublesome to need to retouch every now and then. Petroleum jelly for the lips and J&J baby powder for the face. Now that I'm already college the story became different, I became more adventurous and became so addicted to glosses as well. I noticed a slight change in my natural lip color it kinda became dull so I tried to find a solution for it. I googled lots of stuffs and I landed in an advertisement for Easy Lipstick Quickly Change.The long name clearly gives a hint that its an asian brand but to my surprise the box says that its made from US. The lipstick when used is like a magic lipstick which is a common cosmetic for teenies before. Ad says that lips will turn into natural pink after a sec or so but it actually apply the color right when you swipe it to your lips. Okay so what are the pros and cons? I like the pink color this lippie gives to my lips. Mom says it is drying but it really is not, her lips is just really dry. Last long even if the content is not much. Not sure if it is really from USA. I have seen this being sold in a Chinese drug store in Manila. Online. Try searching in sulit or browse chinese drug stores for this certain lipstick treatment. Around Php120 if I'm not mistaken. Worth the price, I'm still using it until now, its been 3 months already since I bought the item. Hmm..maybe. But not any time soon. I would like to try other trusted brands for now. 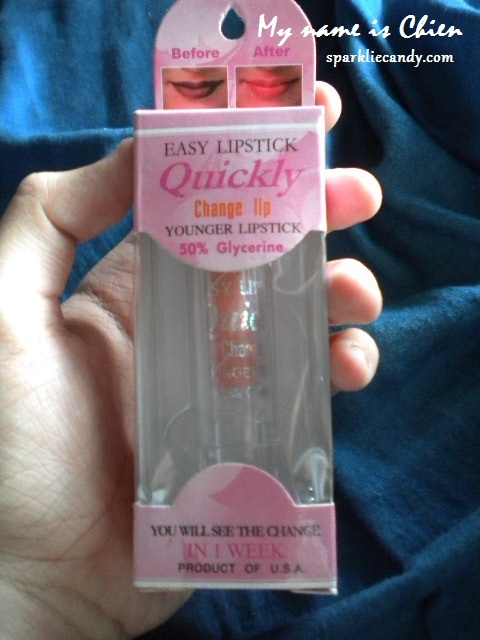 This Quickly Change lipstick has been a staple lippie for me for a while though. Safe color for my lips, not bright pink, not dull. Give it a try if you can. By the way what other brands of lip sticks have you tried girls? Any recommendations of shades that you certainly love? I wanna hear from you! Love lots, thanks for reading! Hi! Are you still using this? Effective ba? May nagbago po ba sa lip color ninyo? Thanks. Hi! Are you still using this? Effective po ba? Nabago po ba color ng lips ninyo? Update please. Thanks! Whoa, i’m 3rd to ask, pls reply naman..update pls about that lippie🙏..is it true to its claim?